I'm constantly looking for interesting locations to shoot around LA, and seriously no better place then downtown. There is always some sort of surprise waiting to happen just around the corner. And low and behold I turn the corner and alas a forklift. 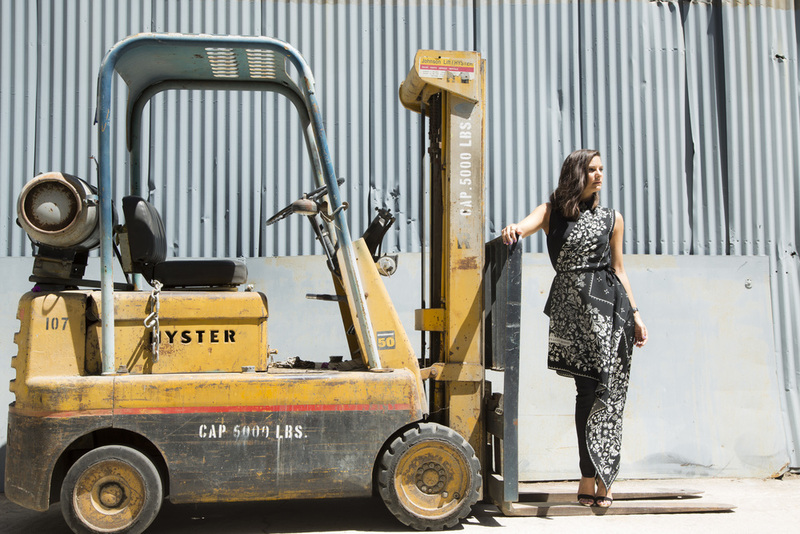 I think we can all agree when you see a forklift in the middle of the city, you drop everything and do a photo shoot. Am I right? I think so.... Coincidentally I just happen to be wearing a top that doubles as a bandana or a tablecloth (construction worker chic) so basically today was a good day. I immediately fell in like with this top, as I am a huge fan of simplicity with a twist. I tend to be attracted to pieces that take a classic silhouette, like a mens button up shirt but have some sort of interesting drama or edge to them. I love the ease of this top, as you just button, wrap and go! Icing on the cake is that it is versatile in the way it can styled. If you have the gams for it, wear on its on with a pair of strappy heels or for a more layered look, throw on with a pair of skinny jeans or black leather pants if your looking for a bit more of a rock in roll vibe... Need to go from day to night? Grab an oversized boyfriend blazer and throw over your shoulders.